For the 2019 model year, the Ford Expedition remains a leading player in the full-size SUV segment for good reason. Combining relentless power with a rich and accommodating interior and state-of-the-art technology, this model checks all the boxes and more. 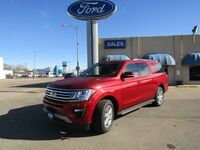 Keep reading to learn more about the 2019 Ford Expedition at Wolf Auto in Ogallala, NE. This model doesn’t take the title “sports utility vehicle” lightly. The Expedition brings in a best-in-class tow rating of up to 9,300 lbs. The Expedition offers enhanced protection for your hitched belongings as well, providing class-exclusive trailer coverage with the available Blind Spot Information System. And the vehicle’s active safety package doesn’t stop there. The Expedition offers more driver-assistance features than any other vehicle in its class, coming through with a collision warning and automatic emergency braking system, a blind spot information system, lane keeping capabilities and more. Often subjected to cramped conditions, third-row SUV occupants are doubtlessly the most neglected of passengers. From the front seat to the way back, the Expedition treats each passenger with its delightfully spacious seating arrangement, offering a best-in-class 36.1 inches of rear legroom. The model also comes through in cargo space, offering 19.3 cubic feet of space behind the rear seats to stow your items. That space expands to 57.5 cubic feet with those rear seats folded and maxes out to 104.6 cubic feet with the second-row seats folded as well. Would you like to supersize that? Setting it apart from the regular Expedition, the Expedition MAX gains an extra foot to its wheelbase. This growth translates to a noticeably larger 34.3-cubic-foot cargo space. The effects of the MAX’s expansion also result in a small increase in cabin space, boosting rear passenger headroom.